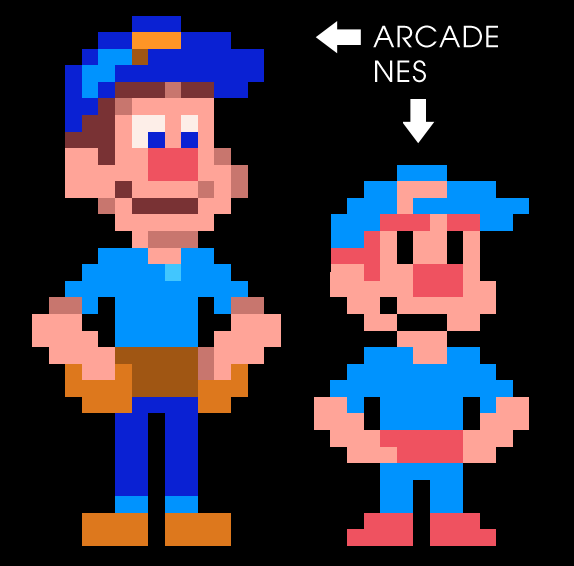 Here's a preview of the new sprite I did up for the fake NES cartridge I’m making of Fix-It Felix Jr. The reason I didn’t just use the sprite that Disney made (on the left) is because you have to take into account the capabilities of the NES—only three colors can be used in a sprite, so it was fun to consolidate Felix’s colors while still making him look like Felix. I got a lot of comments about this sprite on Tumblr and elsewhere about whether the black in Felix's eyes and mouth counted as a fourth color. My intention here is for it to be a "background" transparent color. Obviously, this isn't an ideal solution as it would show the building behind him through his face, but I cite other Famicom games of the time as precedent for this unfortunate workaround! Specifically the lovely Tōkaidō Gojūsan-tsugi by Sunsoft. NES games use sprites composed of 8x8 pixel tiles, which is what I tried to go for. Let’s just fudge it by a pixel or so and say NES style Felix is 16x24 pixels here. Figuring out these kind of graphical cutbacks is way interesting to me! Thanks very much! "De-making" graphics is a great design exercise.